I can’t believe it’s Monday. I was right that I was going to be “off” a day this week. I kept thinking it was Tuesday! Today I once again attempted my hour of forced productivity. I shut down the computer, set the kitchen timer for an hour, and worked. It was nice! I cleaned the kitchen again (no dirty dishes! ), vacuumed, cleaned out the vacuum cleaner, washed a load of laundry, folded clothes, cleaned off the bar counter, filed some paperwork, and started organizing my recipe book. 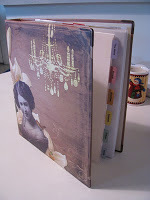 Remember this lovely binder I found for creating a recipe book? That blog post is from June. My recipes are in that binder, but they are not organized. I don’t use the book much for that exact reason. Today I decided it was time to change that. I spent a full hour today trying to find the correct template for these tabs and then trying to figure out how to get them to print so that the labels would display on both sides. But they’re so pretty! I ran out of time to actually start sorting the recipes, but it’s a good start. I have tabs for This Week’s Recipes, Breads, Breakfast, Desserts, Entrees, and Salads. I’m not sure those will be the final labels, but I’ll change things around as I figure out what works best. Tomorrow’s project – Sort through all of the recipes currently in my binder and toss the ones we don’t like or no longer eat. Put the remaining recipes behind the correct tab. Eventually I’ll get them all typed out in OneNote so that they are consistent from one recipe to the next instead of printed from various websites. It’s amazing how much I can accomplish once I kick myself off the internet. It's amazing how much we can get done without distractions. But I do miss the internet at those times. It's like I'm unsure of what to do when I have free time. lol. wow! you got a ton done in an hour! we should hire you!